Gail P. says what was on my mind. It is almost as if we work together. (pssst. We do — on far ends of the building). Writing is on Susan’s mind, too, and her sentence is deep and rich. The colors of the world … ack. I hope the reinstall went well, David. Fred is new to Day in a Sentence (welcome, Fred and be sure to visit Fred’s relatively new blog — he offers a nice take on Malcolm Gladwell’s article on identifying teachers) and he delivers a wonderful reflection on the week in which balance is a key to sanity. Josh is also new to Day in a Sentence (if memory serves me, which it doesn’t always do) and he notes an unexpected twist to one of his meetings. Mary Lee sends her regrets that she didn’t try out the Voicethread from last week (It’s OK, Mary Lee — sometimes, I throw out tools that people can try if they have time or inclination, and I am just happy to have you back here this week). For Mary Lee, the snow was a good thing. Tom, also new to Day in a Sentence and a thoughtful new member in the Western Mass Writing Project technology team, offers up about exploration and integration of technology. Mary (also new this week but see my note above about memory) wants to read … blogs. Unfortunately, the other things in life keep clogging up her plate. Lynn J. saw me posting on Twitter about using Piclits, so she did one herself (you did great, Lynn). Ken started off his new school with, on a very optimistic note. Good luck, Ken. Amy K. is deep into blogging with her students. And it has been a learning experience for everyone. Cynthia bravely pushes herself and her students into new terrain. She may be swamped but I suspect it is worth it in the end, right? Mr. Mansour … I hope you are feeling better. There is nothing worse than the rapid spread of illness in the classroom and at home. Drink fluids, man, drink fluids … and get some rest. And here is a slightly late entry from Bonnie, as she thinks about spring. This week, Ken Allan is guest hosting the Day in a Sentence at his blog, Blogger in Middle-earth, and he has a great theme: Peace. I urge you to head on over to Ken’s blog, take a look around (some great stuff there) and then add your own sentence for the week that centers on the concept of peace. Some folks struggled with this week’s Day in a Sentence, which was converted into Day in a Metaphor. I certainly want to keep the hurdles low for participation, and yet, it seems worthy to add some twists and turns here and there to ikeep us on our toes, right? Using yet another metaphor, this blog becomes a sort of butterfly net when I put out the call for sentences and I am always astounded by the beautiful array of colorful and unique words that come my way. Most important, we never pin them down beneath a glass box. Instead, we release them back into the world and let them fly into our minds. Monday was the Boris and Natasha to my moose and squirrel intentions for the week. — Angie (who notes that she was inspired by her 25-year-old son). My week has been like a balloon, carefree, easy, flexible with no purposeful direction, coloured with the magic of 5 weeks of summer holidays. — Anne M.
Week 3 of our winterbreak is an oasis, a respite, a meditation while the rest of the world cedes into the work flurries of a new year. — Lynne C.
A Half consumed cup of coffee at 4pm is the punch line of the joke that I forgot this morning reminding me that I can’t get everything done when it’s due and that’s okay. — Mary F.
Our neighborhood is wrapped in a blanket of soft, beautiful snow but my “to do” list keeps me prisoner at my desk . . . for now. — Amy K.
And Bonnie, who added her non-metaphorical thought: School closings this week and I watched from my window and remembered my treacherous journeys out and off in my car, dealing with slippery roads. I’m glad I was able to light a fire, sip coffee and write away. Good thing that most schools were respectful to their teachers and canceled. Here’s an old twist to Day in a Sentence. Turn it into Day in a Metaphor. Think about a day or your entire week, and use the power of metaphor to share out your reflection. The way in which you use the metaphor is completely up to you. Just use the comment link on this blog post to submit your metaphor, and I will collect them all and publish them over the weekend. 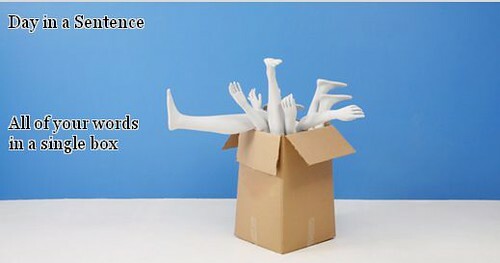 If you are new, you are cordially and warmly invited. If you are returning to Day in a Sentence, welcome back. The winter weather is my Voldemort, thwarting my efforts to complete a big project and weakening the magical powers I use to keep my students engaged in a sustained activity. By now, some of us may be tiring of looking back on 2008 and reflecting on what we learned. Others may be just beginning that process. Here at Day in a Sentence, we shifted gears and expanded our scope, and participants worked to boil down their past year into a single sentence. Not easy, and not everyone kept it to within a sentence. That’s OK. This project is not about the rules, but about the connections. I want to say that there were more than 40 submissions for Year in a Sentence. Wow. I am deeply honored to be part of this journey with all of you. I will start with my own sentence. Like so many others, I was struck by how much my networks have expanded outward and how supportive these environments have become. There is a sense of welcoming in the digital world of educators that is heartening to experience. You can listen to my sentence as a podcast. The reach of my digital world has continued to expand outward as new tools were uncovered, new friends and colleagues discovered, and I pushed myself as a writer into different directions. It has been the most amazing year of my life. Ben was not alone in the Birth of a Child Department. Nancy, too, has been experiencing the wonders of parenthood. She knows that the center of her universe right now is that little soul. As it should be. Tracy is coming to accept that change is part of life. I know change was the Presidential Campaign buzzword (isn’t it always when it comes to political contests?) but many of us are hoping the changes ahead are powerful in good ways. Change is sweet and, though I fight against it with all my might, when I accept it I become more of myself. Cheryl O. notes the many connections she has in life, thanks to technology. I love the last bit of her sentence about closing out the day while others are beginning. A look back to what 2008 has meant: twitter begins my day with a myriad of articles to read, shoutouts to virtual friends near and far, experimenting with new tools; animoto, flip video, keynoting k12online, webcasting SEEDLINGS, and twitter closes my day saying goodnight to some and good morning to others. My friend, Gail P., has immersed herself into the journey of discovery this year and is doing some amazing things with her young students. She’s like a sponge, soaking up experiences and thinking about the possibilities. The past year reminds me of a ride at a theme park. We get some momentum going and enjoy the little surprise experiences along the way, some exciting, others no so much, and in the end we may clap with delight but can only remember snippets of the experience. Now if I could just remember half of what I’ve experienced, tried on, explored, I would be in great shape. It would be a good idea to record every bit of technology I mess around with so I can call upon it again in the future and not just scratch my head in wonderment. We have a google doc along those lines at school that I could drop stuff into. Never in this life will I be able to manage the task anything like Larry Ferlazzo does. All in all, Delaine had a good year, even as headlines shook the world. May 2009 continue in the same vein for her and for all of us. Although a year of financial disaster for so many, we were blessed with good fortune, good fun, and good friends in 2008. Anne M. experienced the “power of the blog” on many levels. It sounds like a scary horror movie — The Blog! — but it’s not. It’s about forging in new directions. What started as a ‘backyard’ blog, grew into teacher, class, student and a school blog(s), sharing and connecting with the globe, working on collaborative projects with many countries and experiencing powerful learning outcomes for me, the students, staff and even parents. Janice gave my new Day in a Sentence theme song some kudos, and it reminded her of an elementary teacher who used to bring in a guitar and play with the class from time to time. I had fun writing the new theme song and found it useful to approach the network from a musical stance. Thanks for your comment, Janice. She writes this week about a fork in the road that she came up again and what she did (no, she didn’t pick the fork up). A decision, which turned out horrifically wrong, led to a second much scarier decision, which resulted in an unexpectedly wonderful experience, and convinced me that taking a chance, and hanging everything on hope and luck, can sometimes work. Lynn J. hopes 2009 trumps 2008. Hmmm, 2008 was not my favorite year…it was probably just a setup for the fabulous one that began today. Perhaps Elona is of the same mind as Lynn. She notes that she is inspired by Dickens. David noted he was bopping to the Day in a Sentence theme song (cool) and then shares this magical sentence that has a real poetic beauty to it. I found between the bells ringing in each year, a silence that is also language, a shared language. Drew used the opportunity to look ahead more than look behind and his wish for the year is one that I can relate to. And I imagine, so can you. My year will be one in which I show more appreciation for what is around me: people, places, things and *myself* and I’ll be sharing what I can at every opportunity. Mary F. noted that the national stage (and international stage?) was filled with too many idiots looking out for only themselves and not for the unfortunate in the world. (I used ‘idiot,’ not Mary). Luckily, Mary could fall back on a loving and strong family to support her. My 2008 was filled with grace from my family, friends and fellow travelers as we plodded together through the mire of deceit, cruelty, and greed from our so-called leaders to find a spark of honor and hope as we begin a new journey with eyes open wide. Mary Lee admitted to some intimidation to the task of reflecting within the confines of a single sentence. Her words remind us that the unknown is with us on so many levels. But the optimism for the future flows out from her sentence, too. This is the year that put cancer ten years behind me. Ken wrote me some thoughts on the theme song, saying it sound a bit like The Ventures or the Get Smart theme song. I can live with that. 🙂 He also composed an epic sentence. Try reading it out loud without taking a breath. And then chuckle at Ken’s wonderful way with words. Well, I must say, it’s been a year with a difference, this year has, what with blogging, which I enjoyed, and my daughter finishing high school, which I celebrated and she’s really bright, not to mention winning the prize for sculpture, which I’ve just done, and going to uni this year to study sculpture, and I won’t bore you with all the great things she can do but she takes after her father, and me walking again and being restructured at work and surviving it – the unbelievable-hope-it-never-happens-again-stuff-like-you-wouldn’t-want-to-know-stuff-and-that’s-life-as-a-school-teacher-stuff, and who would have it any other way, but a school teacher who’s stupid enough to start blogging when he’s two gold watches short of retirement and even at his age and experience has a hard time writing about it all in one sentence, because – for goodness sake – he’s to pack a whole year of experiences, that is successes, celebrations, achievements, failures and disappointments, deaths births and marriages, not to mention advancing old age, all between a capital letter and a full stop. Bonnie is still finding new adventures for herself, pushing the boundaries in many directions. I know she is looking forward to the Obama transition and the idea of change (or at least, of sweeping Bush out of office before he does more damage). A fresh new year! I just read a post on Bud Hunt’s blog about 365/2009,(http://flickr.com/groups/366photos/) a Flickr group that shares a new photo every day. I just sent one over. I have high hopes for 2009: A new president in the White House and a promise of fresh web challenges here. Connie notes how literature allows her to reflect and make note of what is important in life. It all came together for me at year’s end when I read E.B. White, T.S. Eliot, and Stanley Kunitz on the same day; they reminded me of the earthen groundedness of life, and how life is spun up with time. I traveled over 10,000 miles this year, the best part being Paris and London with the family, and — especially if you include my hyperspace travels — I’d say I’m learning at a rate of about one new idea a mile. The downs and ups of life for Cyndi has clearly presented a fair share of difficult hurdles and yet, she ends her thoughts on an optimistic note. The future, after all, is always ahead and peppered with possibilities. 2008-Turned 55, husband passed away afet 10 year battle with kidney cancer, daughter graduated from college and moved to New York City, Son got married and moved to Kansas City, took a new position at Kansas State University, went for 50 students a semester to 150, so moved to Manhattan, Kansas, bought a new house, made some new friends and started a new life adventure. So, it has been a bit of a chaotic year for Michaele, too. And like so may of us, she hold out hope for 2009. 2008, you were full of relocations, packing, unpacking, unemployment, employment, heat, wind, dirt, sandstorms, new and old friends and routines, rainstorms, hail, laughter, stress, family, and self discovery…hopefully 2009 will see a drop-off in the relocations, stress and sandstorms, not that I’m picky! Liza has found her stride as a teacher and that feels good. When you are a new teacher, going through an induction program, you are told quite a bit that what you are experiencing is normal, typical, even and that information is both comforting and irritating, so I shouldn’t be surprised that I am both comfortably and irritatingly finding this year to be the one in which I am reaching my stride . . . finishing my induction year, heading for tenure, achieving better work/life balance, and actually able to raise my head and take a look around me as I’m getting it all done. Julia notes the movement into leadership this past year. For many of us, that is a huge leap that can pay great dividends (not usually the financial kind, alas, but the other kind). From different dimensions and aspects of life, health, educational networks, leadership, and service, this year, for me, has been about moving from the sidelines to participating in the “game” of life. Amy K. knows that 2008 was a challenge. But how she has grown as a result of those challenges is the heart of her reflection. sara‘s sentence reads like a living list. Cue Bob Dylan and read it fast. slush, dizziness, silly nicknames, turning 29, snow days, budgeting, administrators from hell, robins, cuddling, watermelon italian ice, organic nursery, end of school!, sunshine, jogging, slip ‘n slide party, biking, teaching just writing : ), poetry, h.s. football, hoodies, diner mac ‘n cheese, great teaching team, mike’s surgery, master’s, stress, women’s tackle football, christmas, tropical new year’s party… and it’s 2009! whew. Short and sweet. That is Lisa C. for this one. That is how I feel about this year: Too fast! The doorways are central to Kate‘s reflections. May they open wide for you, Kate. Challenge, inspiration and delight from new and old ways, faces, places – doors closing and opening near and far. Harold not only shares out some thinking about last year but also adds in a few thoughts for this new year, too. Keep running, Harold, and stay healthy. One word would summarize it nicely – Change. I started the year as a special education teacher and half-way through became an AmeriCorps Grants program officer, which was a definite change of focus and an injury that didn’t heal until recently, so I got fatter. Run 20 miles a week by August, keep learning requirements of new job, write more comments on people’s blogs and spend quality time with family. Marg sees the connections everywhere. And that is good. 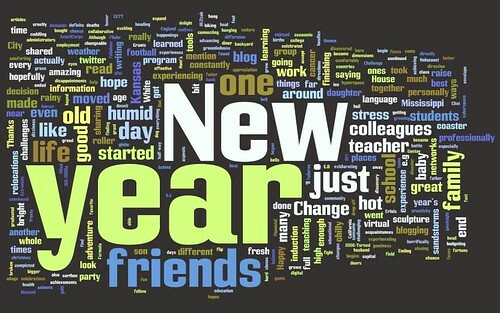 2008 was a sensational year of virtual travel, growing social networks and meeting some inspiring cyberspace friends. Formula for 2009 from a non-math person: Crisis seems >but is actually < human creativity which may = sustainable solutions! And a much hoped for Happy New Year! Larry comes clean. I can relate. Mistakes, yes, and then a few more. But all of it we learn from (if we are lucky). Gail D. continues to move into new directions, but she remains grounded in working with teachers and students on important issues. In a year constantly overshadowed by economic uncertainty, I treasure the bright spots, such as shared moments and walks with NWP colleagues (e.g., Holocaust Memorial Library Summer Institute), opportunities to work directly with teachers and students ( e.g., EETT grant group), and family and friends to share the New Year with. Amy gets off the ride. I hope she isn’t too dizzy. A roller coaster year is completed! Phil remains open to what others have to offer. This old dog learned a few new tricks with a little bit of help from his friends. One small step took Kerry into an ever-building network that she now uses for support and information and ideas. I started off looking for more effective ways to consume information and ended up with a network of friends, colleagues and field researchers. There is a mix of emotions for Justine. Finding the balance is the hard part, right? Extremely challenging personally; professionally exciting and exhilarating. Mr. Woody is in a celebratory mood for the year that has passed. May 2009 bring him and you and all of us more reasons to shout: Huzzah! The roller coaster theme also emerged (with a scream?) 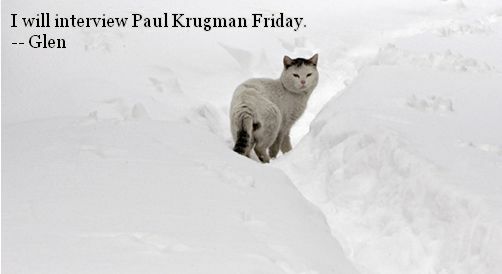 from Sue W., who noted that 2008 was full of the unexpected. Amazing roller coaster which took me on an unimaginable adventure leading to an interesting change in direction by the end of 2008! TDawg (love her nickname) hopes to bring some California warmth to New England. Hey, friend, pack it up and send it my way. Ending the year with a family visit to California infused me with enough love, hope, and sunlight to endure another endless New England winter. Speaking of weather, here is Cynthia (if you listen closely, you can hear her wonderfully melodic southern United States accent — says the guy from New England). There is a saying in Mississippi; if you don’t like our weather, just hang around; it won’t be long before it changes, so as I reflect on 2008, I realize my year was just like the weather in Mississippi–changeable: hot and humid, rainy, chilly, hot and humid, “Gustav” windy and rainy (that’s putting it mildly ), chilly, frosty, hot and humid, snowy (for one whole day! ), warm, and just plain hot and humid. Happy New Year! Kevin, you constantly raise the envelope and push me to try new venues. Thanks. Art has a reflection that hopefully will point to progress for the months ahead. L’et’s hope the air gets cleared and he moves on to some understanding. Some unpleasant revelations led to issues being aired and problems getting worked on. And Nina tried to find balance amidst the ups and downs the year (another roller coaster ride, I suppose). 2008 was for me a combination of thrilling (Democrats sweeping the elections, our first multiracial president) and very sad (deaths of six relatives and friends). Thank you for being on this journey with me. 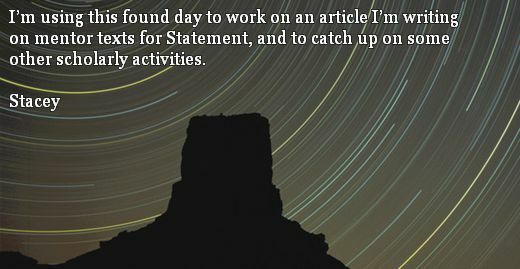 I appreciate your words and thoughts and I hope, if you are new to Day in a Sentence, that you continue with us from time to time and connect with the network of folks who reflect and connect. PS — if you still want to add your sentence, please use the comment link on this post and share away. It’s not too late. Year in a Sentence, plus a new Theme Song! So now it is 2009. Welcome to the new year, everyone. 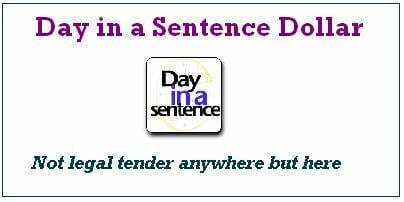 This week’s Day in a Sentence is being transformed into Year in a Sentence. As always, I hope the barriers are low but the depth of reflection, high. I would like you to think about the year that just went by (flew by?) and try to narrow down some element or elements of your year into a single, reflective sentence. Then, use the comment link on this post to submit your comment. I will gather them all up (including my own, which I have not yet written) and publish them early next week. I may extend the gathering of sentences a bit longer than usual, knowing that folks may be away or busy. To help inspire you, I crafted a new Day in a Sentence Theme Song. Actually, it a mash-up of a song I wrote and recorded with an old band (you can hear me on sax and keyboards on the track). I’ll pull this theme song out now and then. And, this week, I was tinkering with a text-to-movie site called Xtranormal, which is kind of interesting, and I made this little video as another way to put the call out for Year in a Sentence sentences. I do hope you find time to join us. You are invited! Thank you to everyone who contributed their Six Word Day in a Sentence this week. They were wonderful to read. 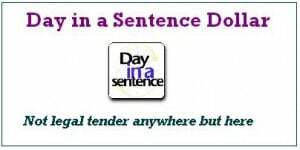 A number of you took my challenge to use alliteration and as promised, I am presenting those folks with the first virtual printing of Day in the Sentence Dollars. I don’t recommend you use it for holiday shopping but please let us know if eBay or Amazon accepts them. 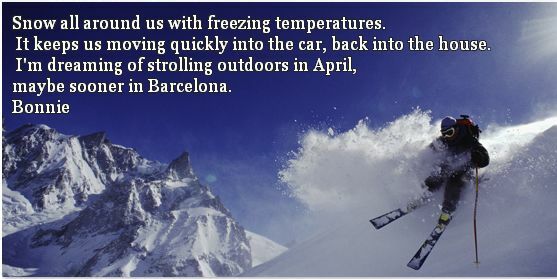 sunshine sensuous Scottsdale sansstudents sanswork seriously — Lynn C.
Ice and snow assault our senses. — Gail P.
Tired teacher seeks comfort food fast. — Lynn J. Exhausted, satisfied, excited….. holidays are here. — Anne M.
Soft snow slowly secludes someone seeking serenity. – Mary F.
Thanks to everyone who added their sentences this week. What the heck … you all get Day in a Sentence Dollars … I am feeling generous and infused with the holiday spirit. NOTE: I AM GIVING DAY IN A SENTENCE THE WEEK OFF THIS COMING WEEK, but be ready for a Year in a Sentence (our annual feature) as we close out 2008. Happy holidays to all of you and your family and friends. Hello and welcome to the miminized version of Day in a Sentence, in which you are invited to boil down your week into a six word sentence. Adding alliteration this week to your six words gets you some bonus Day in a Sentence Points, but they are not worth much outside of this network of friends. Come on … give it a whirl! For me, I am experimenting with a flash animation program called Express Animator, which is awfully easy to use even as I have only scratched the surface of the program in a day or two. There is a free trial worth checking out. I experimented with my own sentence this week using the Express Animator program and made a little video of my sentence. I hope you enjoy it.